Darryl recently hosted the Chinchilla Melon Festival Field Day at his farm ‘Paramagh’, which attraced national and international growers and exhibitors. “I have been using Katek products since they first started 7 or 8 years ago” Darryl explains. 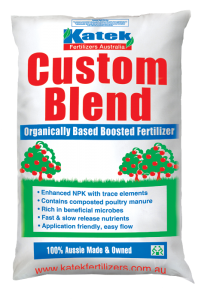 It flows easy and I can get a Custom Blend made up with both synthetic fertilizers and the chicken manure pellets, which suits the soil here. We get great results out of it and we will keep using it“.